We are proud to introduce our Rainbow manicure and pedicure collection- this is just for cheeky grown-ups, who are young at heart. Take a break from “adulting,” and release your inner child. Inspired by favorite fairy tales, retro toys, and nostalgic childhood memories. This collection takes your mani and pedi experience to a whole new level. Each are a unique experience you will never forget- a celebration of whimsical fun. This extravaganza of manis and pedis might be quirky and playful but they pack some seriously strong beauty benefits. All of our rainbow manis and pedis are safe, nontoxic, no harmful chemicals are used, 100% biodegradable, not tested on animals and environmentally safe. 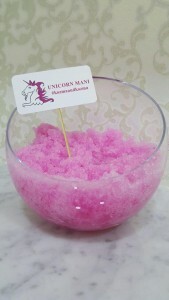 This is the magic stuff that unicorns bathe in, at the end of a rainbow. Comes in a variety of colors- blue, pink, green, red. 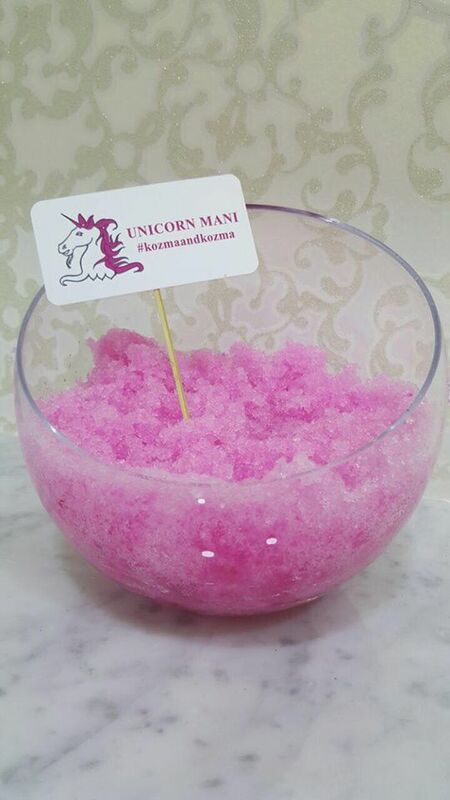 Sink your hands into this lush slush, you will have the most unique, fun and relaxing experience. It looks like a snow cone or a slushie (minus the cold temperature- in fact, the temperature of our unicorn mani is nice and warm). Incredibly fun and mood-enhancing texture you will want to squish around in. Leaves your skin feeling so soft. This is the magic stuff that unicorns bathe in, at the end of a rainbow. Comes in a variety of colors- blue, pink, green, red. 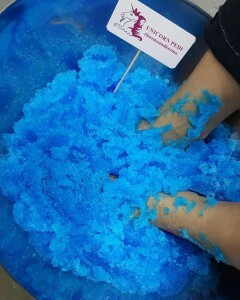 Dig your feet into this lush slush, you will have the most unique, fun and relaxing experience. It looks like a snow cone or a slushie (minus the cold temperature- in fact, the temperature of our unicorn pedi is nice and warm). Incredibly fun and mood-enhancing texture you will want to squish around in. Leaves your skin feeling so soft.